A bounty of butternuts had arrived at my local Trader Joe’s, promising the return of autumn vegetables and, by definition, cooler weather. After a particularly brutal summer, I was more than ready to trade in nightly grilling for soups, stews, and braises. I eagerly scooped one up, anticipating an evening cool enough to turn on the oven for roasting. Several weeks later, as meteorologists were marveling that October 2008 was the hottest October ever in Los Angeles, I started wondering how grilled butternut squash would taste and whether it would make a decent chilled soup. But that would have been too depressing. Instead, I decided to try the butternut squash risotto recipe from Prevention magazine, which calls for the squash to be roasted in the microwave. I’m happy to report that the technique worked beautifully, and I suffered only minor burns on my fingertips while eagerly trying to cut into the still-warm squash. The rest of the dish was fairly straightforward, though I needed a cup more broth than called for in the recipe, most likely because the Arborio had been drying in my cupboard for a very long time. I just kept adding broth in half-cup increments until the rice was tender and had thrown off enough starch to make a creamy sauce. I also added more salt to pump up the sweet squash flavor. 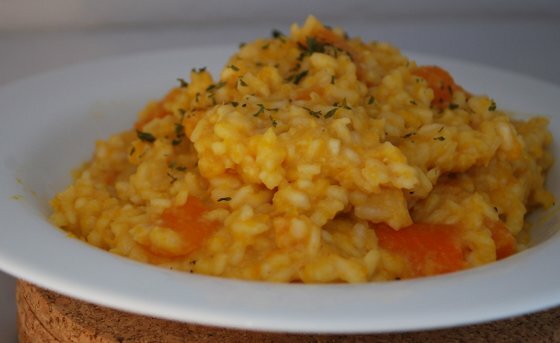 I’d already decided to pack the risotto into the freezer for future use as a side dish. But once it was done I found myself dishing out a plateful right away, convinced that in the kitchen, as in life, some pleasures cannot wait for the perfect circumstances.